That is one dashing pokemon. He is probably the strongest of them all, the only one who cannot be caught. For a game made for children about adorable monsters, there's a lot of really disturbing stuff in Pokemon. Okay, okay, admittedly: It's a game made for children about adorable monsters who are sent out to fight each other for the enjoyment of their owners like gladiators battling at the pleasure of a ten year-old Caligula. But it's one thing to have Mewtwo listed as being the product of "years of horrific gene splicing" (Pokemon Red), and quite another to have multiple creatures whose sole purpose is to drag children kicking and screaming through the gates of Hell, and that's not an exaggeration. That's why today, ComicsAlliance is wandering through the tall grass to bring you the Ten Most Disturbing (and Completely Official) Entries in the Pokedex! At first glance, it doesn't look like there could possibly be anything creepy about Delibird. After all, it's a bird version of Santa Claus, and it's even waving hello! That's adorable! Unfortunately, as cute as it might be, it also has a description that reveals some of the more questionable pieces of morality in the Pokemon universe -- and considering that this is a world where ten year-olds are sent out to wander from town to town getting in super-powered cockfights and busting up international criminal organizations, that's saying something. "It nests at the edge of sharp cliffs. It spends all day carrying food to its awaiting chicks." Again, nothing weird about that, until you start thinking about the fact that you just stumbled across an animal that was carrying food for its hungry children and either beat it senseless, or beat it senseless and then stuffed it in a tennis ball. Congratulations, kid! You wanted to beat Brock, so now there's a nest of baby Delibirds out there that are going to starve to death in the cold wondering where their mother is. Spoink bounces around on its tail. The shock of its bouncing makes its heart pump. As a result, this Pokémon cannot afford to stop bouncing - if it stops, its heart will stop. We've mentioned this one before here at ComicsAlliance, but holy crap, that is grim. It's even worse if you take into account that the object of the game is to battle these things until they faint, and unless it can bounce after getting blown into unconsciousness by a water cannon growing out of a giant turtle, every single battle ends with you straight up murdering it. It's a wonder Officer Jenny doesn't haul you off to be tried as an adult on sight. Right about here is where things start to get weird, and yes: I say that knowing full well that I just discussed a psychic pig that bounces on a spring made from its tail to keep from going into cardiac arrest. Anyway, I've often thought that living in the world must be some kind of constant existential nightmare where virtually every single thing around you might actually be a sentient being that could hold a grudge, and while it's one of the more fun designs-- it's the middle entrant in a series that sees a candle evolve into a lamp that then evolves into a chandelier -- Lampet is pretty much the embodiment of that weirdness. Except that it also wants to eat your soul. This ominous Pokémon is feared. Through cities it wanders, searching for the spirits of the fallen. It arrives near the moment of death and steals spirit from the body. On the bright side, this will no doubt cause a reduction in energy costs, as children will be too scared to leave the lights on for a change. Sometimes, on a dark night, your shadow thrown by a streetlight will suddenly and startlingly overtake you. It is actually a Gengar running past you, pretending to be your shadow. To steal the life of its target, it slips into the prey's shadow and silently waits for an opportunity. On the night of the full moon, if shadows move on their own and laugh, it must be Gengar's doing. I'm really not sure that there's anything I need to explain here about why this is a little creepy -- and let's be honest, the idea of catching ghosts that want to steal your life while pretending to be your shadow and making them fight dinosaurs made of trees in revenge is also what makes Pokemon pretty awesome -- but there's also an added element that makes him even weirder. A lot of fans like to think that Gengar is the actual shadow of the much nicer Clefairy (which is all about the full moon, you do not even know) that has come to life with a hunger for souls. 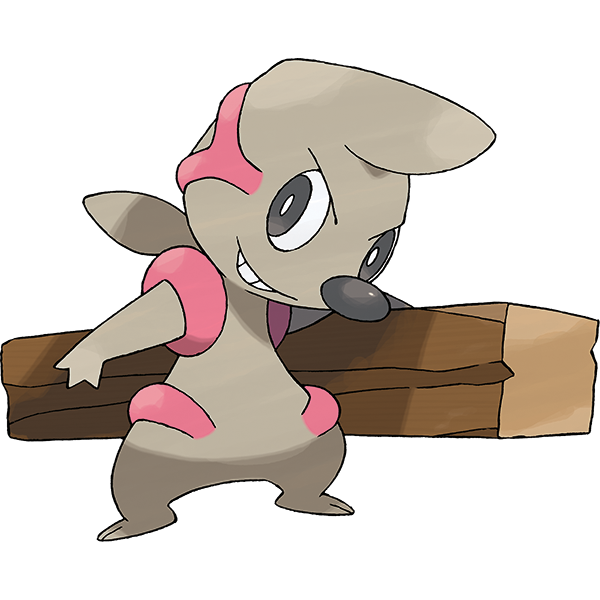 It's not anywhere close to being the official word -- and believe me, Pokemon fans have some really weird ideas about stuff -- but considering that his name comes from "Doppelganger," it does make a lot of sense. Relatively speaking, I mean. Duskull can pass through any wall no matter how thick it may be. Once this Pokémon chooses a target, it will doggedly pursue the intended victim until the break of dawn. If it finds bad children who won't listen to their parents, it will spirit them away--or so it's said. It loves the crying of children. Guys. For real. It loves the crying of children and can walk through walls to spirit them away to parts unknown. Even better, if you give it an item called the Reaper Cloth -- yes, the Reaper Cloth -- it turns into a cyclopean horror that hears radio signals from beyond the grave instructing it to abduct people and take them to the afterlife. It tugs on the hands of children to steal them away. It is whispered that any child who mistakes Drifloon for a balloon and holds on to it could wind up missing. ARE YOU FOR REAL, POKEMON!? A BALLOON THAT KIDNAPS CHILDREN?! WHAT IN THE ACTUAL HELL, MAN? Seriously, these games are responsible for so many ruined birthday parties that I'm surprised they haven't introduced a party hat that controls your mind or a Christmas tree that punches grandmas. I'm starting to think they won't stop until kids are just all bursting into tears as soon as they see a pack of streamers. Shedinja, on the other hand, is a great example of how something can be weird, creepy, creative and actually pretty awesome. It doesn't so much evolve as it springs into being when a cicada that is also a ninja (because why not?) sheds its carapace and evolves into its next form. If you've got an empty slot in your party and a spare Pokeball, the hollowed out carapace becomes reanimated, complete with a halo, as the ghost of something that's actually still alive. Yes, the soulless void inside an animated fragment of the past is hungry for a spirit, so whatever you do, do not look at it from the back. Except that if you ever actually use it, that gaping hole that draws in your soul will be pointed right at you. Whoops? It pines for the mother it will never see again. Seeing a likeness of its mother in the full moon, it cries. The stains on the skull it wears are from its tears. It wears its mother's skull, never revealing its true face. It cries because it misses its mother. It misses its mother because she is dead. And even worse, in the original games, you can actually encounter the ghost of a Cubone's mother (a Marowak), that was killed by Team Rocket. Killed! By Team Rocket! Looks like someone didn't prepare for trouble. There is a bright side, though: By the time you level it up to Marowak, the Pokedex informs you that it "has grown tough by overcoming the grief of losing its mother. Its tempered and hardened spirit is not easily broken." Motivated and toughened up by the death of its mother? Hardened spirit? Dishes out savage beatings to others? Guys, that is basically Pokemon Batman. We can all agree that dolls that come to life seeking revenge are super-terrifying nightmare fuel, right? It's not just me? Okay, how about self-mutilating dolls with mastery of voodoo that are motivated by revenge? That do anything for you? Banette generates energy for laying strong curses by sticking pins into its own body. This Pokémon was originally a pitiful plush doll that was thrown away. It seeks the child that disowned it. Yes, as though balloons, shadows, lamps and Santa Claus did not present enough of a threat on their own, now we have to deal with toys that claw their way out of a garbage dump motivated by pure hate. It's the Black Lantern Velveteen Rabbit, and it's coming for you. The lesson Pokemon is getting at with this one is clear: Never, ever, ever stop playing with your toys. Especially the video games about capturing monsters. And finally, we have our champion, the brand new title-holder for Most Disturbing Pokemon of All Time. Sure, he doesn't look like much -- a little like Phanto from Super Mario Bros. 2 who's had a few drinks and wants to get in a fistfight -- but wait. Just. Wait. These Pokémon arose from the spirits of people interred in graves in past ages. Each retains memories of its former life. Each of them carries a mask that used to be its face when it was human. Sometimes they look at it and cry. All right, let's do this by the numbers. First, the idea that Pokemon used to be people. This puts a whole new spin on the very idea of this game, in that you're running around bottling up the souls of the dead and releasing them to battle your enemies. Ye cats, those televangelists back in the '90s were right all along! Second, they retain the memories of their lives. "I used to have a wife. Kids. I spend a lot of time thinking about them, wondering if they miss me. But sure, kid, I'll go punch that lightning squirrel for you. Not like I got much of a choice." This is basically Dante's conception of Hell. Third, each of them carries a mask that used to be its face. Straight up creepy. Fourth and final, sometimes they look at it and cry. That. Is. Amazing. Cubone cries because it misses its mother. That's just understandable. Yamask, however, cries from the sheer existential horror of what it has become while looking at the face it once wore as a human being before it was reduced to its current state, just breaking down under the sheer weight and indignity of all. Oh, and then it evolves into a sentient sarcophagus that kills grave robbers. I haven't beaten the game yet so I haven't seen the credits, but I am pretty sure these characters were designed by Franz Kafka. Lampent? Why is that there? That's nothing compared to its evolved form, Chandelure. It absorbs a spirit, which it then burns. By waving the flames on its arms, it puts its foes in a hypnotic trance.